The wind chill was 10 degrees. There were gale wind forces of 37-40 mph. Ten minutes into the run I felt like the wind was going to push me over. I then made a turn to go run a hill, ant the wind actually gave me some momentum and I screamed yes. Running had not been fun lately, and I actually wrote a book about it “Running Is Cheaper Than Therapy” I could blame it on the cold, but I have pushed through cold, rain, and snow and I always got it in. Since I have been doing triathlons I have so many workout running and strength training are using the first to be missed weeks I can’t fit it all in. Also I now run on Sunday and that used to be my rest day. “Sundays are for football and Jesus” Well, now I add swimming and running. My rest day is now Monday or Friday and sometimes I swim on my rest day-the life of a triathlete. Don’t get me wrong, overall I enjoy it. The worse is getting out of bed early in the morning. So I am training for an Iron Man and I have to get serious again about my running. So I asked for help with my issue, something that is hard for me to do. I got tons of advice from one of my groups-Fast Chix. I realized than one of my major problem was I was allot slower than my usually pace now. Not that I was anywhere close to qualifying for Boston (Boston is the elite race for everyday runners). My goal at that time was then to get faster. I have a need for speed. So running and seeing my pace, actually discouraged me. I had and have to change my mindset. I began a process of changing my mindset. It is hard. I thought about the times I could not run before and after my knee surgery. I thought about the time I could not run when I have to have a procedure because my plantar fasciitis would not go away. I thought about the other times other “minor” my injuries caused me to be sidelined. I thought about the my first marathon when I ran injured and could not bend my knee past mile but I walked/limped to the finish line. I thought about the breeze that seems to help blow my cares away when I am running. I thought of my friends, team mates who never miss a work out. They may not always be the fastest, but they put in work and they see results. My long Sunday run the week before was in the snow. When I left home it was only a few flakes, but on the way back it was covered with snow. I have been listening ” Can’t Hurt Me” By David Goggins” The book has challenges so one was do things you don’t like to do. I said yes this long snow run on a Sunday was it. I ran my slow 10 miles and felt amazing after I got home. I thought of all of thee above. I thought of my half Iron Man when I was hot and hurting and how I had to keep moving to finish on time. I thought this is the mind set that I have to have when I complete my Iron Man this is my mental training to callous my mind. 2018 is coming to an end too fast actually. I have too much to do today. It was a awesome year overall. God has truly blessed me. It didn’t come without sadness. I lost my dear friends , BA soror, Spec, FAMU classmate Angela Bledsoe. I also lost another classmate Aisha Fraser a friend, soror and FAMU classmate as well. Both were due to domestic violence, a few weeks following their death an active shooter killed a physician his former fiancée at one of my hospitals along with a pharmacy resident, and a police officer. My heart still aches over this senseless tragedy and I am praying and seeking ways to help stop this epidemic that I did not know was so widespread and how many people it touched. My 2018 started with one of my loves skiing in Canada, then Japan. On the way to Japan I got to see two of my running family get married, and saw my team win their first SuperBowl. I went on an epic cycling trip in Arizona where I was literally cussing as I was climbing the first day. I had no idea what I had signed up for. It made me a better cyclist, and my the end of the trip I was loving it. Climbing part of Mount Lemmon was the highlight of the trip. I was so scared when we started but realized it was not bad at all and the descent was fun, but just a little scary. After my cycling trip I flew to our annual National Brotherhood of Skiers (NBS) trip. I was blessed to ski and race. I won first place in intermediate division. I have a need for speed. Following ski season I continued my triathlete training. I made a special trip to Atlanta to start open water swimming early. I also got a chance to see my FAMUly and share my story and sell some of my books” Running Is Cheaper Than Therapy”. I starting cycle criterium and road racing thanks to Dwayne one of my Major Taylor family members. It is scary but so much fun. I have so much more to learn and improve on but I can’t wait for next season. I also completed my first century with my Major Taylor Family. I spend time in Palm Springs and FAMU’s homecoming with my linesisters as we celebrating 25 years in Delta Sigma Theta. I attended the Football Hall of Fame Enshrinement ceremony and saw B Dawkins as well as other football greats get inducted. Other check off of my football boxes was done. I also completed four open water triathlons by the grace of God as the open water scared me every race. Thanks to some angels- kayak people and Joy Miles in Chicago who kept me calm and told me to keep moving. 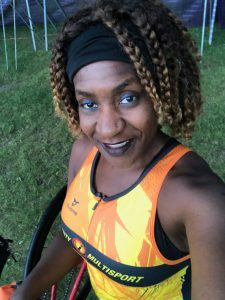 I completed two sprints, one Olympic, and an Ironman 70.3 ( half Ironman). The summer of 2017 I could not really swim, so my goals were a reach, but I made it . Thanks to my coaches, crew, friends, and my Godson who made me stop saying one day and just doing it. Fast forward to the last couple of weeks before Augusta. I was doing my final training for Augusta, and Lake (Ocean) Michigan was not cooperating. The plan was to complete a swim race called Big Shoulder. It is a 1.5 swim “race”. The goal was if I could comfortable swim 1.5 miles in Lake Michigan I would be fine in the Savannah River. Well, there was a National Service alert the leading to the day of Big Shoulder. There were waves from 7 to 10 feet. I decided not to do the race as Augusta 70.3 would be nowhere near those conditions. The race was canceled anyway, but I missed the chance do swim my 1.5 miles. My last few swims in the lake were choppy. One day I literally felt sea sick due to the choppy waves. My last swim was slow 3:15 min per 100/yards. I was disappointed and that was for about 800 or 900 yards. I was thinking that would be cutting it close. I worried my coach, he said my last swim was good that if I kept going I would be fine. That my time was a reflection of my stops too. I said okay. Arrived in Augusta, and my plan Thursday was to swim and then drive the bike course. A sign was located at swim entrance that stated no swimming until race day. I thought oh no, I needed to swim to calm my nerves. There was an organized swim the following day so I just changed my plans and tried to stay calm. I drove the course, it did not seem too bad in the car. There did seem to be allot of turns, although I was not worried about it. Friday morning, I got up to run for 30 minutes, then headed to check in. I said to myself wow this is for real. I met a couple of people in line from Florida. One had completed a few full Ironman races. One was a virgin like me. I got all my stuff, checked out the merchandise. I was paranoid about buying anything until I completed the race. I did buy a shirt with all the athletes names on it. I figured that would not jinx me. Athletes briefing was next. All the run/bike instructions were reviewed, they announced the water temperature- 78 degrees. In order for the race to be wet-suit legal it needed to be 76. Wet-suit optional was what it would most likely be on race day. It was highly unlikely that it was going to drop. The problem would be that it would be the very last wave if I decided for wet suit option It would cause dehydration and the key to making it on Sunday was to be well hydrated. The pre-race organized swim was next on the agenda. I used my swim skin, it does not give as much buoyancy as wet suit, but is helps with gliding and I feel like I swim better with it. There were two options for swimming 700 yards or 1.2 miles. There were only two exits. They had support kayaks out, but I still swam with my swim buoy. I got in and I was calm. The water felt good. I started swimming and saying my mantras. I had several the best one that I struck with that swim was just Jesus, Jesus, Jesus. I did not see the first exit, and was feeling good. So, I just kept going. Stroke, stroke, stroke and breathe. There was debris in the river, but I just kept stroking though it. Forward movement was the goal. I saw what I thought was the end. I thought yes, but it was not. I just kept swimming but I started to think, where is the end. Stoke, stroke, stroke breathe. Finally, I see the end. There was a dock. I grabbed it, and stopped my watch. I could not get out. The person in from of me, helped me out. I looked at my Garmin and it read 50 min. I said praise God that was the fastest 1.2 miles I had ever swam. I thought yes, I can do this thing. I texted my coach and said I know I was supposed to only swim 30min, but I swam 1.2 miles in 50 minutes. He said strong work. He told me to only bike and run on Saturday that I was good with the swim. 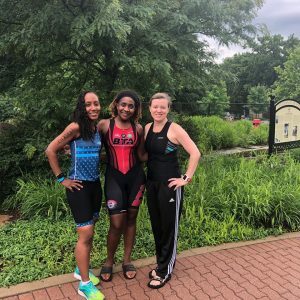 I headed back to swim start and grabbed my stuff and headed to the Black Triathlete (BTA) Meet and Greet. It was great to see some family faces, and meet some new triathletes. Saturday I woke up and the plan was to ride for thirty minutes, and then run twenty minutes. Ten o’clock was bike check in, and I had planned to finish around 9:30am then drop off my bike. The ride started great although my legs were a little sore. I said would ride a few miles of the race course. I ride for 15 minutes but get caught by a train. There were others riding in front of me waiting for the train. They knew a bypass route so I rode with them They were from Florida also. One had done the race a few times. He loved the race, and told me strong work as I told him it was my first 70.3. We rode and got back on the planned course and get caught by yet another train. It was over my 20minutes so I was just try to head back to my car. I finally made it back and ended up doing 30min. I then started my run– 15min out and 15min back. It was nice decent pace for me run. Following the run, I grabbed my bike, and got in line for bike in transition around 9:50am. I thought get there early so I can get a key spot, not knowing that we had assigned spots. I headed back to hotel and got my bag all ready for race day. Everything but my final water bottles. My hotel did not have a refrigerator so I bought a cooler so I could keep my water, Gatorade and some food items cold. That was one bad think about my hotel Ramada Inn. Dinner was my traditional pre-race food Pad Thai noodles. It worked from my marathons, so I figured would be good for this race. I headed to bed about 8:30pm. I woke up at 3:30AM got dressed, and ate a peanut butter and jelly sandwich. I was unable to have my usually pre-Triathlon breakfast … as no freezer to keep my Sweet Earth vegetarian breakfast wrap. I then drunk a bottle of scratch. I had to force myself to eat. I was not hungry. I grabbed my bag, some other nutrition/fluids as my race would not start until around 9 am. I drove to the Marriott hotel. They had shuttles that transported athletes from the Marriott to the transition area. There was a parking lot for $7.00 and free parking on the street by the Marriott. I got in line for the shuttle, there was only one person waiting. It was 4:30 AM, and the shuttles started running about 4:45AM. I met another person from Florida who had done the race last year. I got to the transition and set up my items. I put air in my tires. I was told the heat would cause them to expand and pop, so I let most of the air out them when I dropped off my bike the day prior. I changed my set up after my first three races, after looking at some videos. I put my helmet and my cycling glasses on the handle bars. My transition mat was set up first with some space for my swim items. I then had a towel with some water if I need to wash off my feet. Then I had my cycling shoes with my socks in them. I had already put some baby powder in them to help with smell from the moisture that could result. I then had all my nutrition set up as dictated by my race plan. I had placed them in bags and had them set up in the order then I would consume them. I had an extra bag with base salt, pickle juice, and some lip gloss. I then had my run items outs. I had my shoes, visor, and race belt, and another pair of glasses. I secured a gel, and a package of block to my race belt with safety pin. I then secured a honey stinger chews to my frame so I could quickly eat while running out of transition. I then caught the shuttle to swim start. While I was setting up in the transition area, I talked to an athlete that had done the race in the past. 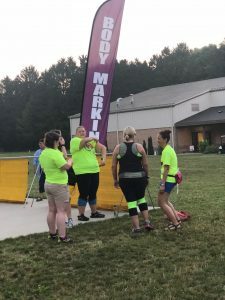 She mentioned that Ramada was the idea place to stay, because it was right at the swim start, and that some of her friends had even taken a nap after setting up at transition. I thought why not I could use a nap, and get rid of my transition bag. My bag was so big and transition was tight. So, I went back to my hotel although and took an hour nap from 6am to 7am. I then walked over to swim start, and dropped off my items at bag drop. The swim start was seeded on your estimated time. I originally wanted to swim with the hour group, but someone said I should go a few minutes before the optional wet suit wave as they might swim over me. I decided to go with the 45 to 50 group. I met so many people in line. Many newbie, virgins like me and some experienced athletes. I even met a random person from Chicago. She thought I was cute, because I had eyeliner on before the race. I told her I liked to be cute. It makes me feel better, and I figured I as a result would race better. I ran to my bike strip off my skin suit. Quickly put on my bike gear. Stuffed my bags of nutrition in my back pockets. I then grabbed my honey stinger chews. Then I ran to the mount line. I saw a few friends from BTA who were cheering on as I passed by. I tried to pick up the pace. My legs were a little sore. I wondering was it because I kicked too much. I thought let me just get into a rhythm. So, I kept pedaling. My soreness improved, but I began having back pain. I thought that was unusually I hardly ever get back pain. When I do get back pain, it is toward the end of a century or longer not at the start of a ride. My goal was to average 15-17 miles. I started off good, first few miles I was averaging 16mph. I tried to listen to my coach and not use it all, so would have some left for the run. I was not liking my numbers though. I passed the first aid station. I had enough fuel and hydration. The course had allot of railroad tracks. They did the best to pad them. It also had allot of turns, and the hills. The worse hills were at between miles 20 and 45. There were not the rolling hills that I liked. I often say the best part of climbing is the descent. There were not many nice descents where I could coast and roll at 25 to 30mph. After the worse climbs, it leveled off. I screamed this is not right. I kept moving, and talking to a few people as I passed them or as I was passed. I made sure to eat and hydrate per my race plan. I even had pickle juice and I drank it just for preventative measures. I did not have time for cramp. I accidentally littered. My top went flying off my pickle juice bottle. There was no way to stop to retrieve it as it flew into the bushes. I thought thank God no officials were there. I stopped at the second aid station. I was almost out of water. I placed Ultima in my water, and grabbed a Gatorade for my second bottle. I ran into one of athletes I met from Florida. I stopped just long enough to fill my bottle and I pedaled on. I was so over the bike by then. I starting having side stitches that I only have ever experience running. They are so bad I started literally screaming. I keep pedaling but I had slowed down. I was glad no one was around because I would have scared them. Then I decided to sing, so people would not think I was crazy or scare people. I was in so much pain, and almost started crying. I wanted to quit, and I knew I had to get it together. I was close to 50 miles by then. Just keep pedaling I thought and stop worrying about the race time goal. The stitches went away but then I had bloated stomach pain. Something did not agree with my stomach. I thought I had not different fuel I had used on my training runs. I continued to drink although it seems like it my stomach hurt worse. I was so over the bike. I wanted to speed at the end because it was flat, but I did not have it in me. I finally make it back to transition. I thought praise God the dismount line. I see my Tri friend Natalie. She asked how I was and takes a pic I tell her like death, but smile. I walked fast, I had no run in me not in my cycling shoes. My feet were actually hurting. Not bad but they hurt. I placed my bike on rack, threw off my helmet. Then grabbed my race belt with gel, and block, visor, and my shoes with elastic shoe string. I stopped by the porta potty. I walked out of transition to try to loosen up the legs. I then started to run. My stomach was better after finishing the bike. I thought I am tired and I really am not feeling this run. I run intervals so I just thought concentrate on running five minutes, and then you can rest one minutes. I told myself to not think about the whole 13.1 miles. My goal was to run five minutes. I started and my pace was my usual. I thougt great, just keep moving. I see some familiar faces on the run. People I knew, some of the people I passed and had passed me on the bike. I met a few people on the course. The crowd support was awesome. Everyone was cheering, the kids, the volunteers. People didn’t know my name they would try to pronounce it, call out my race number, or call me sunshine. They had rest stop about every mile. I stopped at all of them except the very last one. I needed the hydration. I also mixed the water with the Gatorade. I also had the coke/red bull combination. It gave me a boost. I kept moving and soon I was half way through the first loop. I ran pass my hotel and thought I could stop and just sleep, but kept going. The BTA crew was pass my hotel. They were cheering, yelling, and gave me so ice to cool myself. I kept running. I would slow and then speed up. I had my idea pace from my plan and just finish pace. I was successfully in maintaining something in between the two. I then her someone yell Major Taylor- the name of a African American cycling legend It is the name of my cycling club. A couple of my cycling friends had drove over two hours to come cheer me on. It warmed my heart. I waved and they took a couple of pictures. I then ran back by the BTA tent. Von from BTA yelled your coach says to speed up then she takes some pictures. I speed up for a few minutes. I still tried to keep a twelve minutes per mile pace, but no slower then 15 min per mile. I kept moving. I finished the first loop. I only have 6.6 miles left I thought. I got this. I had no idea what my time was or even if I made the swim cut off because my Garmin did not capture my swim. I kept running the worst case numbers in my head and I thought they I should be good. I just had to keep running. I started to slow down around mile 10. I was running a 16 min miles. I had to speed up. I passed my Major Taylor friends, and the BTA tent again. I saw the finish line and had a little over 1 mile to go. I keep running. I stopped at second to last aid station. My legs were so tired. I walk longer than I was supposed to after the station almost half a mile. I then start running. I ran by a officer who said I had 400 yards left. I thought about my speed work and how it was hard sometimes but I pushed to make it around the track. I ran, and ran. I hear people saying that the finish line was near. I actually stopped, and put some lip gloss on and fluffed out my hair. I had to look nice as I ran across the red carpet. I was told the video would be shown forever. I then got my strong running stride, and smile on my face. I saw the end in sight. They announced my name “ Ouida Brown from Chicago first 70.3” I made it. Yes, I finished but I had no idea if I made the cut off time. I see some of the BTA crew in the food area. I then see my Major Taylor crew and thank them again for coming. They say that they tracked me. I ask if I could see, and saw my time. I said praise him I made the cut off. I then looked at my swim time if was 52. I said praise him again. I felt like crap and my stomach was hurting. I felt like I could throw up so I did not hang out too long. I grabbed my bag. I turned on my phone and the first text was from my coach. Two pictures and “Way to Rock”. I guess Von from BTA was his spy. Well I did it, and it was the hardest race I have ever completed. I have run nine marathons, but this was so much harder and longer. I did not meet my goal as formulated by my race plan but I finished before the cut off, I did not drown, or die so I made my ultimate goal. I recommend Augusta 70.3 especially for a first time 70.3 racer because the swim is great for beginners. The current, the support, the point to point swim made it idea. Sighting was easy all the buoys were on the left, except the last one on the right. 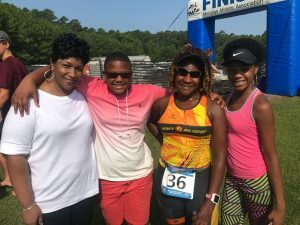 My first triathlon season was awesome. It was hard, no doubt. I had some major challenges along the way. The scariest thing was when I literally could barely see after swimming a mile in Lake Michigan. I figured if I could make it pass that and still race I can do anything. That and manage my fear of water, I have yet to totally get over it. It is a work in progress. Not in my wildest dream would I think that I would successfully complete the four races that I have completed. Looking forward to planning for my next season. This race was a mental reach for me. My first two Sprint triathlons, the swim was a total struggle, and I was now doing an Olympic distance race. Lake Michigan had won on so many occasions, but I kept on going to battle. I was not giving up. I had the support of my Infinity team, as well as others. I would go swim by myself, and swim with other groups. The Ohio beach where I swim has a lifeguard, and I always had my swim buoy so I was always safe. Everyone encouraged me. I knew I could swim, but my nerves/my mind often got the best of me. Thursday prior to the race, I went to the beach to swim. My goal was to make sure I swam a mile. If I could swim a mile the 0.9mile would be no problem. Chicago Triathlon does not have a time limit, so as long as I keep moving I would be great. I swam my slow mile. It took me an hour, and my new googles held up. I could see to sight, there were no leaks. However,I had a new problem. I could not see when I got out of the lake. Everything was blurry, like I had cataracts. I got dressed and figured it would go away. It didn’t. I walked to my car, as I had to get home. I googled “blurry vision after swimming”. It listed many possible reasons- chloride, chemicals, etc. Also it recommended saline drops. I drove slowly as my vision was poor, and was light sensitive. I went to Walgreens and my eyes were worse. I had to have one of the staff at Wal-greens help me find drops as I could not read the labels. I purchased some clear eye drops, and applied the drops to my eyes and they got worse. I got to the point that I could not see my phone text messages or any print on my phone. I called one of my doctor friends who knows everybody to see if she knew an eye doctor. I did a phone consult, and she persuaded me to go to the emergency room. As I was getting ready to go, my eye site improved. I could read text and print on my phone. I called the on –call eye doctor and she told me I should come in but it could wait until morning. I go the following morning They ran all kinds of test, and the verdict was my new googles were too tight, and my eye dried out. I also had an underlying condition called Fuch’s dystrophy, and this condition predisposes me to have blurry vision. This condition was unknown to me. The doctor gave me some drops to apply every hour to hydrate my eyes and says I could race. I feel relieved, but I was so tired as I did not get any sleep the night before. Saturday I met with my coach for a practice swim, I so wanted to stay in bed. I still was tired from being up Thursday night. I had to test my new googles though to see if they leaked, to see if I could see while swimming and after I exited Lake Michigan. My new googles were perfect no leaking, no fogging, I could see during and after the swim. I swam about 1300 yards so I felt ready. I also had to do a 20min run and my legs felt great. I was ready. I decided to go to the SuperSprint to cheer on some friends. I then did my usual race prep. I rode the bike course the part I could and visualized the part that I couldn’t. Transition opened the day before the race, so I decided to take CC my bike on Saturday to get a prime spot that would be easy to find, and get to the bike out. The ends had been taken, there is always more room on the end, and it is easy to exit. I picked a stop by the wave sign so would be easy to find. I woke up at 3:00 am got dressed, placed on my chip and number tattoos on my arms. Chicago TRI does temporary tatts versus marking arms with race number. I then ate my usually pre-race meal- Breakfast wrap. I grabbed my TYR bag, water bottles, and Uber over to the start of the race. I live about 15-20 minute walk away, but it was dark, and I figured would save my legs for later. I got there about 3:40, and walked to transition. It opened at 4am, so I had to wait in line. It opened I headed to my bike. I set up like I had before, but this time I make sure I had my nutrition out. I could not find during one race, and this was a longer race so I know I would need to make sure I ate, and had adequate hydration. I got my stuff out of the swim- wet suit, googles that had baby shampoo in them to prevent fogging, and the cap that they issued. I then set up my helmet with cycling glasses in them, bottle of water if I needed to rinse off my feet, cycling shoes with powder in them and in shoes. I then had my running items- race belt with bib, visor and running glasses. I get to my area, grabbed my eye drops to apply. I put on my helmet, glasses, dried off my feet, put on my socks and shoes, and grabbed my nutrition. I started with my Honey Stinger Chews while I walked to bike mount line. I started to ride. Biking is my strongest discipline although I am an original runner. I started up the ramp, and my chain dropped. I thought not today. I quickly slipped it back on. Then I took off. My first two races I was the last or one of the last people out of the lake, and am a strong biker so I generally pass allot of people on the ride. This race as there are so many waves what would not be possible to be last. I passed allot rides and got passed allot too. While Chicago is flat, they picked the few hills that we have for the course. Drafting is not allowed, so I was putting in work. I made sure to hydrate. My first two races I was so concerned about not being last I neglected to drink. I could not do that today, as it was a longer race and it was going to be hot. I saw some of my training crew on the course, and a member of my cycling club ahead of me. I saw my coach on the turn around, and he passed me an told me to pick up the pace. I thought I was doing well, but he stated “ Chase these guys”. I kicked it into high gear and passed a few. We got to Wacker Drive which is underground, I grabbed my almond butter as we slowed a little for the turn. Bike racing while I am not great helps so much with the controlled turns, and steady accelerations especially when I get dropped. It was cool, and flat so I took off. 22 to 23mph. It was so much fun. I have a need for speed. I get to the next turn around and more flats. I tried to kill it. I see my coach again. He give me a nod, I assume it was doing well as far at the pace. I see two people who had crashed, and thought oh no. I kept moving though. I had a goal pace and I was going to reach it. In my hast I neglected to get my 2nd hours Honey Stinger nutrition . I made that last turn and I was back at bike dismount. I was happy I made my time. I ran to my area dropped my bike. I moved people stuff that is all over my mat. I apply my eye drops. I then grab my visor, shoes, and running glasses. I walk out to run course. I eat some of my waffle honey stinger. Although I hate having stuff on my stomach when I run. I grab some water. I walked out to run course. I eat some of my waffle honey stinger. Although I hate having stuff on my stomach when I run. I grabbed some water. I run 5/1 interval—run 5 minutes, walk one minute. I decided to walk the first intervals to “get my legs back”. I started with the second interval and I felt strong. I then saw the Infinity/ BTA tent and heard my name. I was so awesome to have the support. I kicked it into higher gear. I felt great, like some of the speed work was paying off. I was still slow, but closer to where I was last year training for New York I thought. I kept doing my intervals. I slowed at each water/Gatorade stop. It was starting to get really hot. Around mile four I started to get light headed. I thought oh no, let me slow down so I can finish and not pass out. I saw one of the run course marshals and I asked if he had some salt. I walked a bit and I felt better. I tried to run, but at a slower pace. I had about 1.5 miles left. I ran into Rudy who I had met the morning before the swim. He gave me some calming words then, and told me to come on we have to finish strong. We ran together until the last stretch. I did whatever sprint I had left in me and crossed the finish line. I was so happy. I had made it. I completed the Olympic distance triathlon. Ir was hard, it was rough, but I finished with a smile on my face. 20min over my estimate due to heat and long transition. I was proud nonetheless, it was a PR as my first anyway. 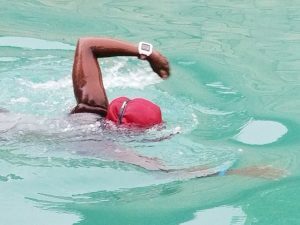 Last year in June I started swimming lesson, and I had just completed an Olympic distance triathlon. My goal was to speed up so I could make my cut off time in all three disciples for my next race. The plan will be to to work on not stopping so much. I also to better hydrate for heat, and keep doing the speed work. It also helped that allot of my speed work at lunch in the middle of the day. My ankle has healed and now have to continue to put in work, but not so much as to cause another running injury. Chicago Triathlon was fun, but challenging . I can’t wait to do it again. A week prior to the race, I shipped my bike via bikeflights to a bike shop in the Jackson area. It arrived on Monday prior to my arrival on Thursday. I landed Thursday and go straight to bike shop to get my CC (my bike). I then drove to my brother’s house to assemble my bike. This was my first time using Scicon bike case, so I was a little anxious. The beauty of the case is that it does not require much assemble or disassembling. Everything was fine, but on the bottom of my frame I noticed several scratches. I get upset, as my bike is like my little child. Then I put my wheels on and my rear derailleur seems off, so I get more anxious. It was too late to take back to bike shop. My brother stated calm down you can also just ride another bike. I look, and say that it is not that easy. I am a somewhat functioning nervous wreck. My stomach is in knocks, and I am not doing much talking at all. I did come home to see my family too, but I was not in the mood to catch up. My plan was ride, and swim on Thursday, but that was not happening. Sleeping seemed like the best option. I get up early, and decided to get a swim in in the pool to help calm my nerves. I go to a pool outside of Jackson and swim 1000 yards straight. I figured if I could swim 1000 yards, the 598 would be okay. After my swim, the bike shop was open. I take my bike, and the mechanic stated that my derailleur just need to be adjusted. He stated that it was fine. He also adjusted my front derailleur. This made me happy, and helped me calm down a little. I decided to head up to Meridian which was about 1.5 hours from Jackson. First thing I did was drive the bike course. It was hilly, and had a few turns. Then I rode by the lake, the buoys were set up but there was no one around. My plan was to get a quick swim in, but not by myself. It was too early for check in, so I went to check in my hotel. Race check in started at 5pm. I get my bib, and bag. I saw other people swimming. They did not have an official race prep, but I do get my question answered. I decided to swim to calm my nerves. I swam out to the first buoy with the kayak. I made friends with Terry in the kayak. I told him I was nervous. He told me to wear a red cap, and he would look for me on race day. I said deal. I woke up at 3:30 AM, I could not sleep anymore. I did stay in bed until 4:30AM. My stomach was still in knots. I could not eat, but I know that I needed something for fueling purposes. Transition opened at 5:30 am. I get there at 5:30AM. People were already set up. I could tell they were experienced triathlete just from their bikes. All high end triathlon bikes, and they had the end spots I wanted. I picked an area near swim exit where I would clearly see my bike. I set up my items like my last race. First a towel to wipe off my foot, and a bottle of water if I needed to rinse dirt/sand off. My helmet with my gloves, cycling glasses, head wrap, and my cycling shoes with socks and baby powder in them would be next in order. This race because I have the speed suit, I decided to have my half zip Tri top out to put on after the swim. My nutrition would be in my back pocket already. Last race I could not find my nutrition. So my plan was to have in place. That way I did not have to worry about. It would be in place in my dry Tri top. Next, was my visor, race belt, and running shoes, and a water bottle. I put my speed suit half way on at the hotel, as it is hard to get on. I knew I would be visiting the porta-potty so I did not bother zipping it up. I can’t zip or unzip on my own without getting into some awkward positions. I talked to a few of the other athletes. They gave me advice, as they could see I was nervous. I see the couple that I met the night before. I finally meet David J who had been so helpful. He is a member of BTA- Black Triathlete Association. I had posted on the Facebook page to see who else would be at this race. He asked how many races I had done. I told him one. He said he was surprised, that I looked experience. I told him I had a great coach, and training crew- Infinity Effect. We were allowed to get in the water to warm up. I get in and do some strokes, and some drills as my coach suggested. That took my nerves from nine to about six. The time was ticking away, and it was time to line up. This race seeded athletes in the order of registration. I was number #36. I made some friends in line as I waited. Each person started solo after they crossed the mat. I did the crazy leg run, and one dolphin wave. Then I started to swim. I tried to remember my coach Maurice saying to start slow. So I tried not to panick and take it easy. I made it to the first buoy. I grabbed it a minute to take a few breathes then I proceeded to the next one. By then more people were in the lake, which me more nervous. The people were to my left, so I just tried to stay right. I got winded, and I flipped on my back, and talked to myself. “Ouida you’ve got this calm down”. I don’t though. I raised my hand I wanted a kayak to rest. I raised my hand again, and thought okay what if I was in real distress where are the people. Finally one of the rescue boats comes. I say that I was not quitting, that I just needed a rest. They said grab on. I could not see where to grab. I finally saw and take a rest. I told them I was good, and continued to the next buoy. I then saw my kayak friend Terry. I swam to him. He was right next to the second buoy. The buoys were set up in a triangle configuration, and I took another rest. My googles were a bit foggy. I lifted them up just to see how far the next buoy is. I adjusted my googles and swam to the next one. My friend Terry said he would stay with me. I swam to the next one, then take another rest, then looked around. I asked am I the last one in the lake. He said no, there were a few others. I sighted to the flag pole it is right where the exit was. I said that I am almost home. I stroked, and stroked. Terry said that I was swimming better than before. I said, I was ready to be out of there. It seemed so far away. I tried to swim until I could feel the bottom, as my coach instructed. Terri and the guy at the exit say you can stand now. I stood and stepped to the exit. There was a large step up to the mat. The guy asked for my race number, I said hey can you help me. They were supposed to pull us up. I also asked could he unzip my speed suit. I ran to my bike. I sawmy BFF and God kids. They had made it. I ripped off my speed suit, and tried to put on my Tri top. It took me three times to get it on right. I thought maybe that was not the best idea. I put on my head wrap, glasses, and helmet. I then dry off my feet, get my sock and shoes on. Last I put on my cycling gloves. I was not the last person out of the water, as I saw a few bikes left. I mounted and the race started on a hill. One of the guys who had his bike placed right next to me told me to start in small chain as there is a hill at the start. Also my coach always states that too in order to get the legs moving after the swim. My heart was racing after the swim, which is normal I learned after my first race. I still tried to pick up some speed. I wanted to gain some time from the horrible swim. I gained some speed at it was flat for a few minutes, but there was a turn so I had to slow down. I see my brother, he had made it. I sped out to the highway. It was on, nice and flat for a few, then the first incline about 550 feet came. I saw a few people walking. I asked if they were ok, they say yes and I cruised on. Then the descent, which I alway love. I coasted, got some water my heart rate was finally slowing. I came to the third major turn I again picked up the pace. There were a few people cheering from their homes. I see David J from BTA headed back. I passed a few more people. I saw the couple that I had met, and a few others I meet the morning of the race. I rode and rode. I tried to get some nutrition. I took a bite out of my waffle and the rest fell to the ground. I thought, oh well. I kept pedaling, the turn around was near. You had to make a U-turn then head back. I was thinking that this is fun. The highest elevation was 619 feet what was not that awful. I continued to roll passing a few more. We get back to the highway, and the last major incline. I thought almost back let see what I have left. I tried to go as fast as I could but the turn back into the Lake area was near so I had to slow for the turn. I rode to dismount, and ran to get my visor, glasses, race belt and shoes. The race pack had a nice small water bottle in it. I thought this would be nice to run with. I walked the first minute I put some electrolytes in my water as I was wanting some last race. I hydrated then I started doing my intervals 5 to 1. I felt great for me. I feel like I am running my usually pace 11:30 to 12. I looked and was actually faster. I saw my family, and my God kids run on the side with me a minute. I make it to the first mile. I think great. I am still keeping my pace. I got to the water station. They refilled my bottle. I slowed up a little not on purpose. There is shade on far end of lower lake. I picked up a little speed. I continued on I still feel good. I had one mile left. I kept running. I saw the finish line. I picked up the pace, I wanted to finish strong. I ran and crossed the line. I looked and looked and thought where are the medals. No, medals WTH I did not know this. Not that I run, race for medals but it is nice to have one at the end. Oh, well my brother was waiting for me at the finish line. He hugged me and then my BFF with my God kids congratulated me. I made it Triathlon number 2 was done. It felt great other than the swim. As I was packing up my things I see Terry the kayak man. I thanked him for helping me make it out of the water. Rest for a min, and back to training. Next up is Chicago Triathlon. I need to get my mind game right- the swim is my struggle. I will overcome though. I was really upset with my swim, but then I thought this time last year I could not make it half of a lap in the pool without stopping. I completed my first open water triathlon. It was rough, but I made it to the finish line with a smile. My first race was in Mattawan, MI at Pretty Lake Camp. My original race was supposed to be the Women Naperville Triathlon which is an easy race for beginners. It was cancelled. My coach recommended I do another before my race in Mississippi since I can’t wear my wetsuit as it will be too hot. I searched for one on the internet that was close and the week of July 4th. I found the perfect race on the 4th of July so I could relax and enjoy the House Picnic during weekend. I arrived in Kalamazoo at my hotel at 3pm, and it was only eight minutes from the race. I checked in and got my items together to do a practice swim. I had emailed the race director so many times, that when I checked in she knew me. I wanted to make sure I could do a trial run the night before to calm my nerves. I checked in at 4pm and asked when I could swim, the people at the registration desk did not know what I was talking about. So, they took me to the director who said “OK Ouida, yes you can swim at now, but buoys are not set up”. They also had to verify that I could wear my own swim cap. I am latex allergic so I can’t wear most race caps. I usually now email and ask if I can wear mine and if they have a certain color so I can match my age group. Then I hear the bad news, that the water temperature was too high. It was around 80 degrees, and that we could not wear our wet suits. I almost started crying. I was like no, I have never swam in open water without it. They asked if I have a swim buoy, and that I could wear it. I thought that this must be a low stress race if they allowed swim buoys, so I calmed down. I walk to the swim start. The race staff was so nice they all introduced themselves to me. There was a race meeting that was aimed at first time racers. After the meeting, some of the buoys were set up. I did a test swim to the first buoys and one of the race staff rode in a kayak beside me. After my swim, I was good. I went to my hotel, I set all my item in my transition bag and went to bed. I arrive to transition at 6am right when it opened. I set up close to the run in from the lake. The run in was from the lake was pretty far– upstairs, and through gravel so I wanted to be close. I bought an awesome transition mat from Amazon, and had my items set up in order. I had my swim items on of course, but I had a towel to wipe up my feet first, and water to wash off the sand. Then, I had cycling gloves, and my cycling glasses, and head wrap in the helmet, with the socks inside my cycling shoes. I had put baby powder inside the socks. I then had my running shoes, visor, and race belt, and running glasses. I only forget to set out my nutrition to have if I needed it. People thought I was a pro with the set up, and were surprised it was my first race. I then went to get my body marked. We then walk to swim start, it was about a 10-minute walk on a trail. I decided to wear my swim neoprene booties. They are to keep my feet warm in Lake Michigan but with running upstairs and in gravel, I figured it would give my feet some cushion. I was in the fourth wave. They had men in two waves start first, then women age 40 and less, then women 40 and above. It was an L swim, point to point swim- 500 meters. The horn went off and I started slow, people were passing me. It was an overall small race, so not too many people around me. The last wave the relay swim started, and they all passed me. I stopped allot to catch my breath, and make sure I was going in the correct direction. The sun created a glare so I could not see some of the buoys so I would stop take off my googles, they continue swimming. One of the swim staff came and asked if he could stay with me. I said that was fine. I look around, and see that I am the last person in the water. There were a few swimmers right in front, but I was dead last. He said it is okay you are almost there and you will finish. I make it to shallow water then start to run. I run up the stairs. Some of the staff I meet the day before remembered my name, and yelled “ Go Ouida”. They were clamping and cheering. It made me not feel so bad for being the last out of the lake. Swim time 24.32 min- Garmin distance read 675 yards. I thought I swam close to buoys so not sure why I had almost 90 over. I ran to my bike strip off my booties, swim cap, and swim buoy. I threw on my head wrap, helmet, glasses, and get my gloves. I ran to mount line, and realized I dropped my gloves. I ran to grab it. Then stopped my watch. I forgot to start transition time when I got out of water. I mounted CC, and take off. My heart was racing, and I was breathing so hard. I thought did I kick to much, why am I so winded. My goal was to kill the cycling. I started off at 19 to 20 mph. The first part of the race was flat. I start passing people. My heart rate finally normalizes. There were a few turns so I had to slow to safely corner. I am so glad I drove the race course so I would be prepared. Although they did a wonderful job marking course and they had an actual person at all of the turns. About 20 minutes into the ride there were some hills, which slowed me down a bit. The last turn the person left her post to go to the car, again so glad I drove course as I knew the turn without a doubt. I am still passing a few people. The end was flat so I tried to pick up the pace. I turn in and one of the staff yelled “ way to go”. I dismounted and run to the mat, rack my bike, yank off my helmet/gloves/glasses. I get my shoes, belt, visor and glasses. The run started on a nice road. I drunk some water to hydrate. I wanted some nutrition, but I had no idea where it was. I knew I packed some the night before. I walked the first minute to get my legs. I then start my intervals. I have been running 5 to 1 intervals for years due to my plethora of running injuries. I am actually coming back from an ankle injury and was not up to my usually pace. My goal was to run 12 to 12:30 miles per min pace. My prior pace was 11:30 to 12 miles per min pace. I did well the first mile. It was trail run, but was flat, and ground was firm. After the first mile we turned in some grass, and the ground was uneven. I had to watch my footing. There were a water station at 1.5 mile mark. I wanted an electrolyte drink, but all they had was water. I felt depleted. It thought not much too go, I can make it. The rest of the run was shady, and that is the only think I can say good about it. There was grass, hills, twigs, actually small trees that we had to step over. There was also this trough area that was like stairs so I decided to walk. I was more worried about falling or reinjuring my ankle. I thought better safe than sorry. It was not like I was going to win the race, and I would not be the last person. I walked a mile, it then leveled out, and I ran the last 0.7 miles. The last 0.2 miles was on a road. I thought now this is what I am used to, I have to try to finish strong. I run through the finish line, and got my medal. I had made it, I just thanked God that I made. I then saw the race director she smiled and said you did it, and gave me a high five. I was so happy. Tri For the Fourth of July is a great race, if you like trail running, and I don’t. It also had great support staff, especially for new triathletes. (I am a triathlete now—love it) The other athletes were so friendly too. Random people came up to be after the race, and said that they were cheering for me. The swim is actually easy if you are a strong swimmer. The lake was calm, and pretty clear. I did not like the long walk to start, or long run out of the lake though. The bike was great except the turns I wanted more speed. The inclines were not bad, maximal 1045 feet. I recently rode Michigan Mountain Mayhem, so judgement maybe screwed in that area. The run just sucked to me, as I don’t like trail course. It truly was an obstacle course. My next blog was supposed to be a race report following my first open water triathlon. Well, my first official race was canceled. It was quite a mess. It had rained the day before, and the forecast kept changing. I was praying that it would not be so bad that they had to cancel. So I get up and drive the 45minutes to Naperville- outside of Chicago. It poured the whole way along with thunder & lightening. When I arrived, I was informed that the race was delayed until nine so the storm system could pass. So, we wait it out, it cleared up then started raining again. The race officials were worried that another storm systems set to more toward us would come right doing the race so they canceled it. It was upset, and the communication was poor so that made it worse. So, a group of us go eat, and have mimosas. It is about 9:00 and it is clear, the storm system never came. That made me more upset. Fredricka stated let us do our own triathlon. Centennial Beach where we were supposed to race opened at 11. So that is what we did. We swam 900 yards in at the Beach. I went home, and rode on my trainer 13.3 miles, and then ran 3.1 miles. It was not the same, but it made me feel better. No easy introduction, for me. Centennial Beach is a man-made beach that is more like a large pool with no waves. Most races will not afford me with such an easy swim. No problem training will continue. I had more first plunge into Lake Michigan the infamous Promontory Point last weeks. It was not too bad, my preparation for my first race that was canceled gave me some confidence if nothing else. Tri for Fourth I will be ready for you, then onto Sunfish Triathlon in my home state Mississippi. 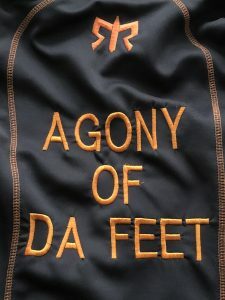 My first Ragnar team describes my current dilemma. While everyone who knows me, knows I love running — ” Running Is Cheaper Than Therapy.” While, I love running, often running does not always love me. I have had a plethora of injuries. Most of them have involved my feet–stress fracture, Achilles tendonitis, ankle sprains, plantar fasciitis, pain around scar after had a procedure for my plantar fasciitis, and mid-foot pain. Now my injuries include both of feet. My right one was jealous, so it had to get a little action. I am on IR list, but I am not totally out. I can walk/run intervals. I walk more than I run. I end up aggravating my injury if I do more than that now. I have a condition called sinus tarsi syndrome. Sinus tarsi syndrome is common after an ankle sprain. Although, I never sprained my right ankle, I sprained the left before New York Marathon in November 2017. It also occurs in people with flat feet or people who over pronate (people who turn foot in when running) 2017 . I pronate, and have a low arch. I have had laser treatments which have helped significantly but still I have minor pain with running. So today I got a cortisone injection and will take it easy ( for me) and later this week resume my progression to return to running. I thank God for triathlon training as I can go hard with swimming, cycling , and strength training. When I was injured in the past all I had was the gym, and honestly it is not my favorite place to be. I would rather be outside. I am stubborn which is a blessing and a curse, and I will ultimately be back and better than ever. Thank God in advance for my healing. I have just a few races coming up- five to be exact. I would like to share a video talk that I recently prepared for MRDS anniversary. Men Run Deez Streets (MRDS) just recently celebrated it’s five year anniversary. I was asked to give a talk, and I would like to share my video talk this week. I had to take my own advice as I am recovering from an ankle injury . Some information on MRDS- MRDS is an organization that was started in Chicago, but not five years later has national roots. The organization inspires men of color to make running a consistent lifestyle.